Microsoft are once again running their TechDays series in the UK, a series of full-day FREE hands-on sessions on training around the UK. I’ve attended these in the past and can highly recommend them. 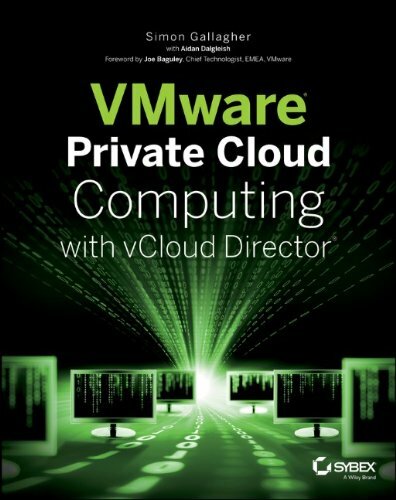 There look to be some excellent sessions, you can sign up here I am attending the private cloud session and look forward to getting some hands-on time with System Center 2012. 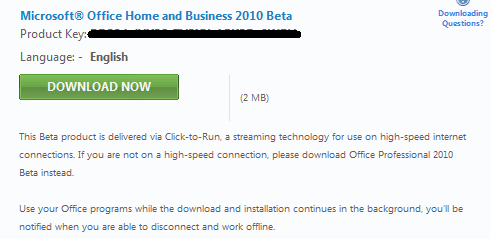 This is clever, Microsoft are going to offer a version of Office 2010 that you can install on demand using the App-V technology that they acquired from Softricity a few years ago. I like the idea of App-V technology (and VMware’s ThinApp equivalent) a lot for the desktop and space it’s a very clever way of delivering apps. 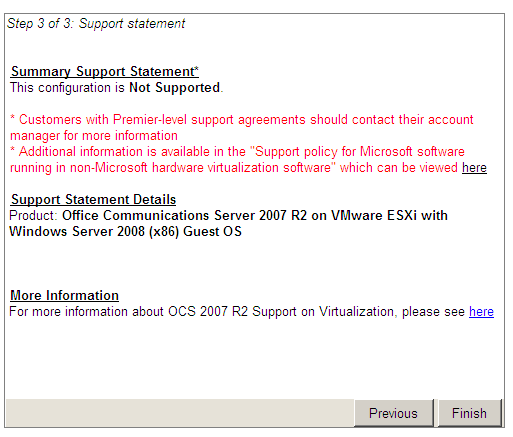 Bring your own Windows license for EC2, but where are Microsoft? I’ve looked at this a fair bit – Microsoft have their SPLA service provider licensing, which is a monthly rental that EC2 must leverage for their licensing, and customers can obtain this sort of licensing from any accredited service provider as long as the license is used on and in provider owned equipment and datacentres – you can’t legally take those SPLA licenses and run them in-house, you need to re-license under a traditional Microsoft license agreement. 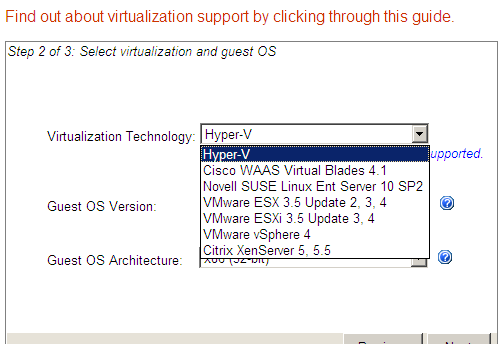 If you have a reasonably fixed Windows server footprint that you want to run on EC2 this is a good idea, or maybe lots of spare Windows licenses left over following an internal consolidation/virtualization programme. If you need to scale up and down on a monthly basis (which is more akin to the typical EC2 use-case, although the minimum unit of purchase for SPLA is 1 month, EC2 works on the basis of hours) – SPLA is still probably more cost-effective as SPLA typically works out more expensive than a perpetual/EA type Windows license over 3 years, so you pay for that flexibility. This is another offering in Amazon’s arsenal, combined with boot from EBS to tempt corporate customers into it’s IaaS platform. most enterprises don’t necessarily need all the “clever” EC2 features like automated scale-up and down but want somewhere easy and reliable to store their corporate systems. You can see an interesting market opening up for IaaS cloud services between EC2 and vCloud resellers for enterprise Windows customers, but the big question is, where are Microsoft? Do they have to have some kind of offering in the IaaS space in the pipeline (Azure is pure SaaS/PaaS at this stage); I’ve not seen Microsoft do any real GTM effort with partners around building this sort of cloud service like VMware have done with vCloud. 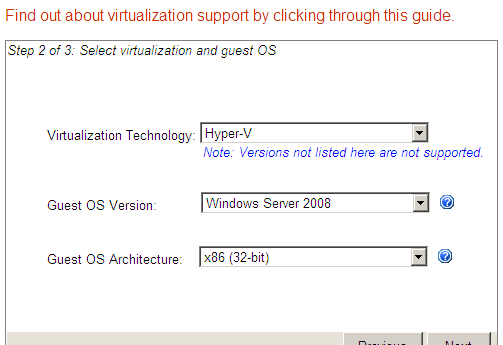 Microsoft have all the tools/software/frameworks in place in terms of Hyper-V/SCVMM but lack a productized offering and marketing back-up to partners (like BDD, but for servers & cloud) are they are starting to miss the boat? The Windows Server User Group have announced another free evening session during the UK Tech Days week in London. The [WSUG] Windows Server User Group has the pleasure of hosting Dan Pearson, from David Solomon’s Expert Seminars, http://www.solsem.com/ Dan is in London teaching the week of TechDays UK and has kindly agreed to present on the evening of Tuesday 13th April (18:30-21:00 at Microsoft, Cardinal Place, London) to the community. There will be a social gathering afterwards. Registration: Chick Here (NOTE even though the event says GMT it is BST). While Windows crashes are rarer these days, when they do occur, you need to know how to isolate their root cause. This session explains why Windows crashes to protect the system, the types of crash dumps you can configure, and how to analyze them with the Microsoft Debugging Tools. Also covered are how to deal with hung systems and systems that crash without taking a dump. Several real-life case studies are presented. Formerly a Senior Escalation Lead at Microsoft, Daniel worked in the Windows Base OS team supporting Microsoft customers. He performed crash dump analysis and system level debugging, spending the majority of his time either in a debugger or reading through Windows source code. Daniel also worked in the Mobile Internet sustained engineering team that released hot fixes and service packs for Microsoft’s Mobile Information Server product. He has presented sessions on Windows internals at Microsoft sponsored conferences and user groups. Prior to joining Microsoft, Daniel worked at Digital Equipment Corporation on both Intel and Alpha systems running Windows NT doing system software support for enterprise customers. Dan Pearson is speaking in March at Microsoft’s Tech Days in Finland and Belgium. The Windows Server User Group are holding a talk on the evening of April 12th at Microsoft’s London offices near Victoria. This event compliments Microsoft’s tech-days week which I previously mentioned here. BranchCache is a new Feature in Windows Server 2008 R2 and Windows 7 that helps reduces the bandwidth consumed and improves end user experience while accessing intranet-based HTTP and SMB content. This session introduces challenges in network performance often faced by remote branch offices which accessing content stored in servers located in datacenters across trans-continental Wide Area Networks, and how BranchCache helps in addressing these challenges. You will learn in depth how BranchCache works and see a demonstration of this new feature in Windows Server 2008R2 and Windows 7, as well as learn how to configure BranchCache. Presentations and live demonstrations on how the new Windows Server 2008 R2 migration tools can simplify the migration of Windows Server roles. Joey will provide a detailed insight to the Windows Server 2008 R2 Server Migration Tools; The session will include migrating file services, DNS and DHCP to Windows Server 2008 R2. It’s free to attend and although the full agenda hasn’t been released yet but I would hope they have a decent amount of technical content. There are also similar tracks for developers. 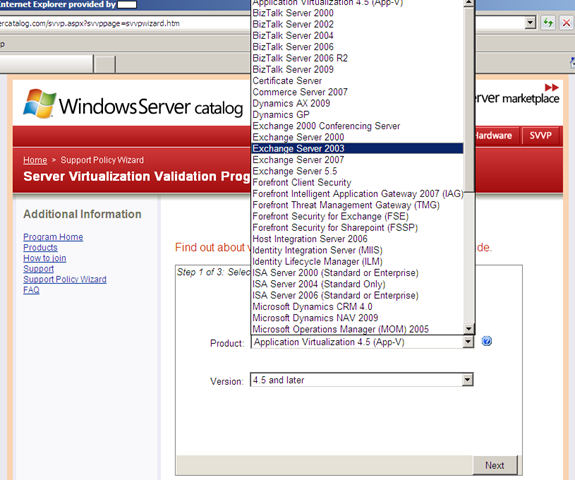 A colleague has just made me aware of a new tool on the Microsoft website, it is a wizard that can tell you if specific Microsoft App/OS/Architecture combinations are supported under the SVVP (Server Virtualization Validation Programme) – I previously wrote about the SVVP here, which promised to resolve many of the pains we were experiencing. The output from the SVVP programme has been compiled into a great web based wizard that saves all the previous leg work of reading several (sometimes conflicting) whitepapers.. here you get it straight from the horses mouth (so to speak). I’ll be attending this user group event this evening in London; if you’re local and interested then I believe it’s never too late to register. 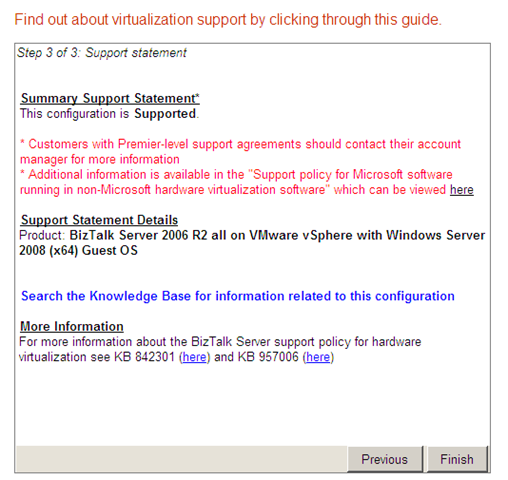 Application virtualisation – what is App-V? I’m on my way to Microsoft TechEd EMEA 2008 in Barcelona on Sunday, I’ll try and post some details of the interesting content as I go, but incase I don’t carry my laptop round with me all the time I’ve installed the Twitterberry client on my trusty BB Pearl and will be posting “tweets” as I go; they’re on the side-bar of this page or you can go directly to my twitter page here. I’ve never really used Twitter before so I’ll see how it works out. I missed it last year due to work commitments, and I’m looking forward to it as there have been lots of good releases over the last year; Windows 2008, HyperV and information on upcoming releases like Azure and Windows 7. If you’re not going to TechEd, or are still undecided I would direct you at some of my Tech-Ed related points on this post, I totally recommend it and if you have to do any kind of consulting job it’s a must IMHO. you can’t buy this level of training/content and it’s a bargain – even if you have to pay door-rates. The wireless at TechEd is always excellent (unlike VMWorld..), I’ve not worked out my session schedule yet but will try and do that ahead of the start and give you an idea of the session content. I’ll be there with a couple of colleagues from ioko including Mr Techhead himself, leave a comment if you are interested in meeting up over the week.